Halloween Soda Cans! | Dinosaur Dracula! Just launched a special feature: The Creepy Commercials Countdown! A nice guy named Larry donated a slew of ancient Halloween-themed TV commercials, and in the spirit of making mountains out of molehills, I’m turning them into a month-long event. 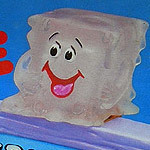 Every day during October, a new (old) creepy commercial will be posted. 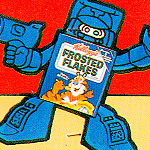 Up first something about fruit snacks and skeletons, from 1989. Go, read! Besides, I have other things to fill the blog with. Like pictures of my cat. Kitten is an unpredictable cat, capable of loving and annihilating with equal passion. She’s the one we have to warn people about. Kitten will bite and scratch over the smallest infraction. Don’t even think about touching her back legs, because her reaction should be studied by army generals. Handling Kitten is a bit like handling an alligator. You have to cradle her with one arm, and clamp her trap shut with your free hand. This isn’t an ideal situation for anyone involved, so when it comes to cat/human interaction, we generally let Kitten make the first move. Anyway, that’s her. She’s trying to chew the yoke off a six-pack. 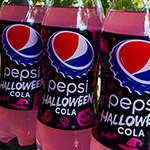 …which brings me to my point: Halloween soda! 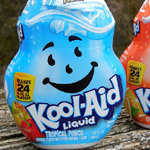 Well, actually, the sodas are in their normal flavors. It’s the cans that got the upgrades. Four big name brands, redressed for the Halloween season with terrifying designs. The really cute thing is how tiny they are. There are eight ounces in each can, and though that’s only a 33.3333333% drop from the norm, they seem more like half the normal size. They’re perfect for parties, and I imagine that that’s their purpose. Tiny cans of Halloween soda, for tiny people’s elementary school costume parties. 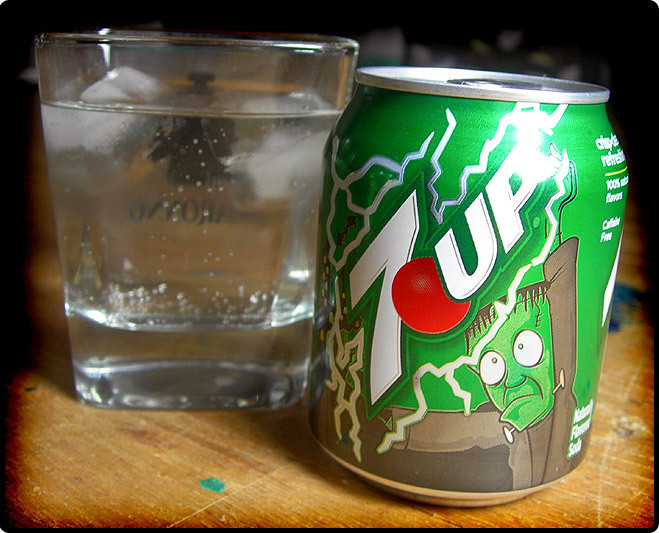 Gracing the 7 Up can is Frankenstein’s Monster, and you know, I’m really tired of being the only one who calls him that. Everyone else just says “Frankenstein.” Why can’t I? Wide-eyed and looking a bit confused, Frank is either wandering aimlessly or using his magic hands to summon lightning. Really depends on your POV. 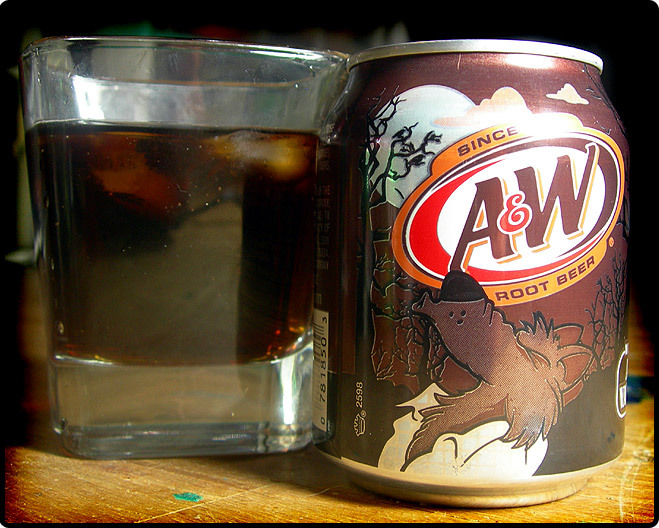 A&W Root Beer got a werewolf. 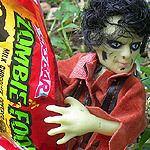 I’m no huge werewolf fan, but I can’t think of a monster better suited to brown soda. It helps that this is a pretty cool werewolf, whose cream-colored shirt betrays a secret enthusiasm for high fashion. Judging by the design, this werewolf is clearly in the midst of howling. Looks like a pretty serious howl, too. Actually, it looks more like an “ow.” We’re catching the werewolf at the precise moment that he stepped on something sharp. Given how bare the trees behind him have become, I’m betting it was one of their spiky seed pods. Sunkist wins, in every conceivable way! I almost never drink orange soda, but it is the perfect color for the season. Plus, if these cans really were made with Halloween soirees in mind, orange soda is always the right choice. It’s just completely synonymous with parties. I can’t explain it, but I feel like I don’t need to. It’s something we all know, even if nobody can articulate why. Gracing the can is Dracula, and he looks GREAT. 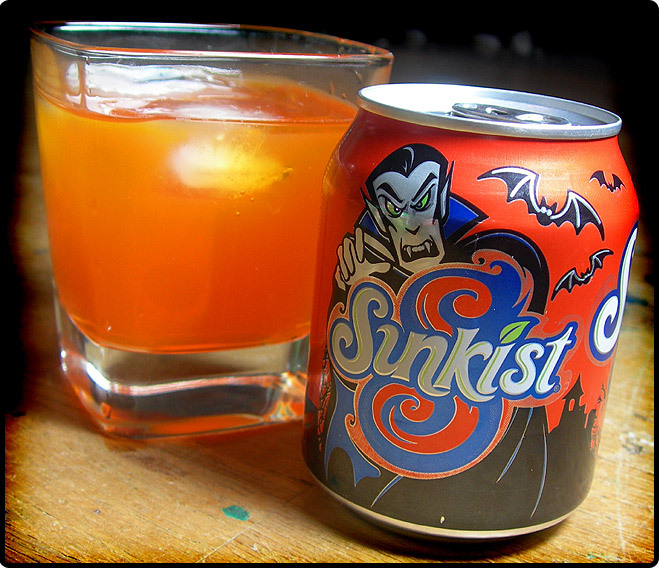 He’s green-eyed and evil, and he’s using the Sunkist logo as a shield. As his victims brainlessly wander toward the bright logo, Dracula prepares to attack. A team of bats flies close, looking to pick at the leftovers. 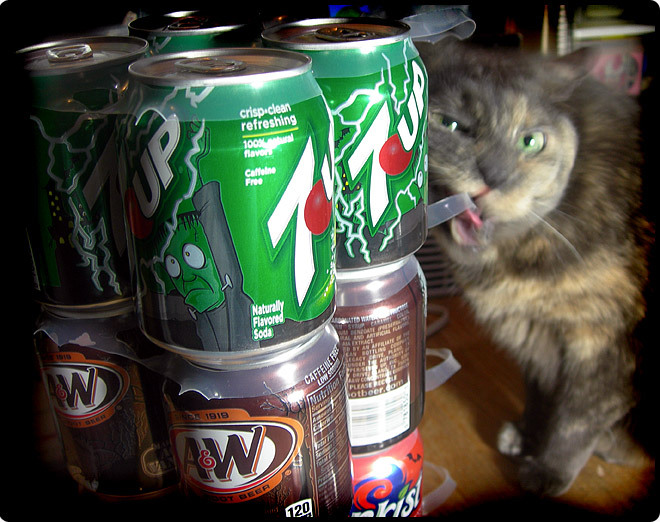 This is grisly territory for soda, and I appreciate that. 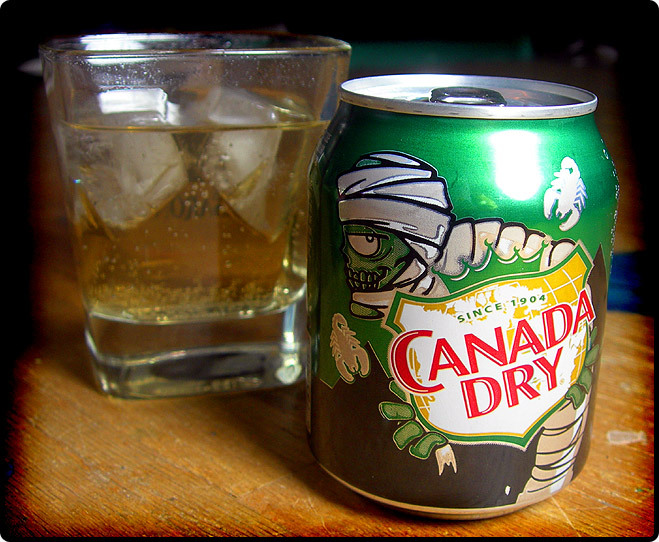 Finally, Canada Dry gets a mummy. It isn’t as plain as it sounds. 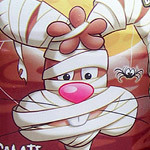 This mummy appears to be part zombie, and he’s flanked by a pair of deadly scorpions. I see these three as a team. The scorpions aim for their victims’ feet, effectively slowing ’em down so the famously sluggish mummy can catch up. When he does, all three eat together. In my version of the story, mummies and scorpions eat people. Of course, since we’ve now established that the scorpions aim for feet, we must consider the possibility that the A&W werewolf is about to be devoured by a mummy. That was no seed pod. Talk about cross-promotion. It’s like when Sophia used to turn up on Empty Nest.